Hi to all Malaysia Fuel Price app user, first of all I would like to thanks all of you for your support and help. Because of you all guys, I still able to continue this project for free. Two weeks ago (on 25th October), Malaysia Fuel Price app latest version (1.3.0) has been released to Google Play Store. If you're still using previous version (1.1.0 or earlier), you are required to update to latest version by 31st December 2017. Note: At the moment, you still can use the old version, but effective on 1st January 2018 onwards you will no longer able to use app version 1.1.0 or earlier. Hai, saya ingin kongsikan salah satu tool baru yang saya bangunkan baru-baru ini. Projek ini lebih kepada hobi dan sesiapa pun dibenarkan untuk menggunakannya secara percuma. 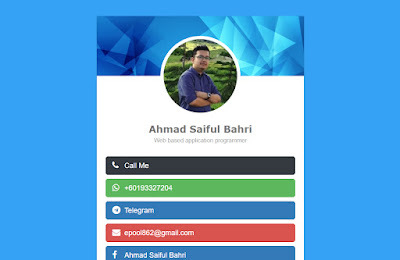 Seringkali kita menghadapi masalah untuk minta rakan-rakan atau pelanggan kita menghubungi kita, kadang2 kita hantar no telefon atau email untuk dia hubungi kita samada melalui Call, Whatsapp, Email, dan sebagainya. Kadang2 dia kena simpan dulu nombor tersebut untuk Whatsapp, atau kena copy paste untuk buat panggilan telefon, hantar email, dan lain-lain. Kenapa bukan perkhidmatan lain seperti email, panggilan telefon, telegram, dan lain-lain. Jadi saya buat projek ini untuk menyokong semua jenis komunikasi. 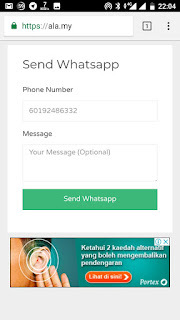 Today i would like to share tutorial step by step on how to send a Whatsapp message quickly, easiest way. This would be very useful if you use Whatsapp on daily basis to communicate with your client or customers. 1. Open Chrome browser (or any browser) then go to https://ala.my2. Enter (or you can copy and paste) recipient phone number3. Write your message (optional)4. Click button send. Done.You can also add shortcut to your phone home screen (i really recommend this), so you don't have to manually open this website each time. There you go, every time you want to send Whatsapp message to your customer or client, you dont have to save their number in phonebook first anymore. Go to https://ala.my now and try it!